Some of my most memorable fish have come when I’ve had to work for them. Size doesn’t necessarily have anything to do with making a fish memorable. 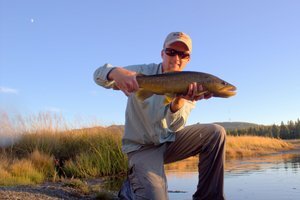 One of my more memorable fish this summer was just a small brown trout. I remember that fish well for a reason. I caught the fish by formulating and following a careful yet simple game plan. Often a fish is memorable because of a great cast. Several years ago I was fishing a stream “somewhere out west” that also happens to be one of my favorites all time. 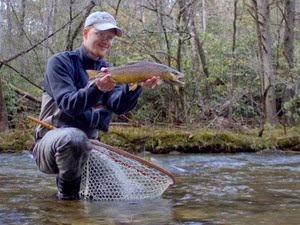 The stream had trees lining the banks so the casting conditions were very similar to my home waters here in the Smokies. 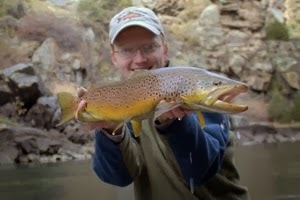 I had spotted a nice 14 inch brown rising just upstream, but the fish was in a very tough spot to cast into. A branch was hanging low over the stream directly above the rising fish making the presentation difficult, at least to me at that stage in my fly fishing career. The cast would obviously need to be punched up under the limb if I wanted any chance to catch the fish. My first cast was perfect with the fly landing far up under the tree and miraculously not snagging on the foliage. 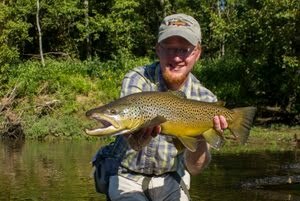 The fish did its part by casually eating the fly and soon thereafter I briefly admired a beautiful wild brown. 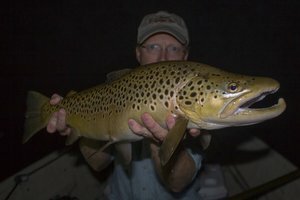 I’ve caught many browns since then and will no doubt catch more but I’ll always remember that fish with a sense of accomplishment. Catching a memorable fish generally comes down to the ability to carefully observe and then analyze the situation, planning the presentation, and executing the game plan. Another brown was memorable more recently. Once again it was not for anything particularly great, just a feeling of accomplishment when everything came together exactly as I had planned.